All NSS members, except Basic and Family, receive several periodical publications as part of their membership benefits. the prestigious Journal of Cave & Karst Studies, published three times a year, also on paper and digitally. The JCKS was formerly known as the NSS Bulletin, from 1940 through 1955. Non-members can subscribe to the above publications online or by mail. American Caving Accidents is published every 1-2 years as an extra issue of the NSS News. The annual NSS Members Manual provides a detailed look at the organization of the Society and contact info for all of our members. All NSS members may access archived back issues of all NSS periodicals in the Member Pages (requires login). grotto newsletters from around the United States. 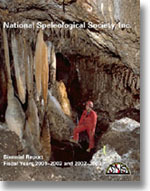 The NSS regularly publishes a wide range of BOOKS on speleology, caving techniques, and caves, which may be purchased at the NSS Bookstore, where members receive a discount. Vendors wishing to stock NSS books should contact the NSS Office for information. AUTHORS: Any and all material published by the NSS requires a copyright agreement. Please click here for copyright requirements.